"Get me up at 6:00am. I need enough time for Easter basket, presents and collecting eggs before we leave for church." This eventful sunrise agenda was followed by some righteous church going. (Yes, Declan, you do have to wear a belt.) Children's choir singing, the story of the Resurrection, and more candy filled eggs on the church lawn because Jesus wants you to have ridiculous amounts of candy to commemorate your everlasting life. All of this before 10:30am. Then we wait. We wait for the ham to bake, for the relatives to arrive, to drive the long, 4 mile trek to Val's house where the smell of freshly baked pie and the crispy edges of salty ham mingle together as we enter the house through the kitchen door. At least that's what I am waiting for. Ava is waiting for cake. First, Ava found a recipe for a fancy cake in Food Network Magazine. 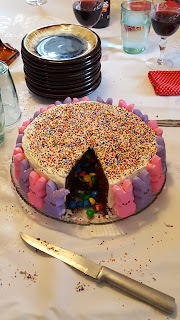 I thought we could make it better by using a chocolate cake base (isn't everything better in chocolate?). This time, I was smart and we used the foolproof recipe from the back of the Hershey's Cocoa can. No problems, yet. Frosting is something that I feel I need to master. I have made it many times but it often comes out grainy, or just not quite right. So, I thought, "Why not use the recipe from the fancy cake in the magazine?" I should have known when I read the ingredients list: "egg whites and butter?" and the advice: "don't worry if it starts to separate?" These bits of information should have been red flags. I chose to ignore them. We soldiered on. Bad idea. Four egg whites and 3 sticks of butter later, all we had was a separated, gloppy, chunky mess. A barfy looking mess. This would not do. I began to swear. Not good. Thankfully, my child is resilient and knows I am like my mother (except for the swearing, my mother, Val never swears). 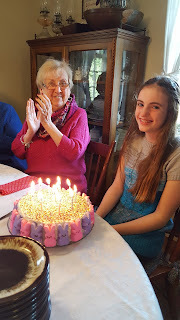 Val always has enough sugar and butter in the pantry and neither one of us will give up until we get the special cake right for a precious 12 year old birthday girl. But forget trying to remake that stupid frosting recipe. Time to go old school. Better Homes and Gardens Cook Book. It's a classic for a reason. 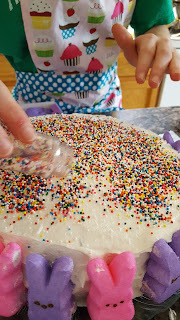 7 minute frosting (which took me 10 minutes and until my arm almost fell off) was our saving grace. Phew. 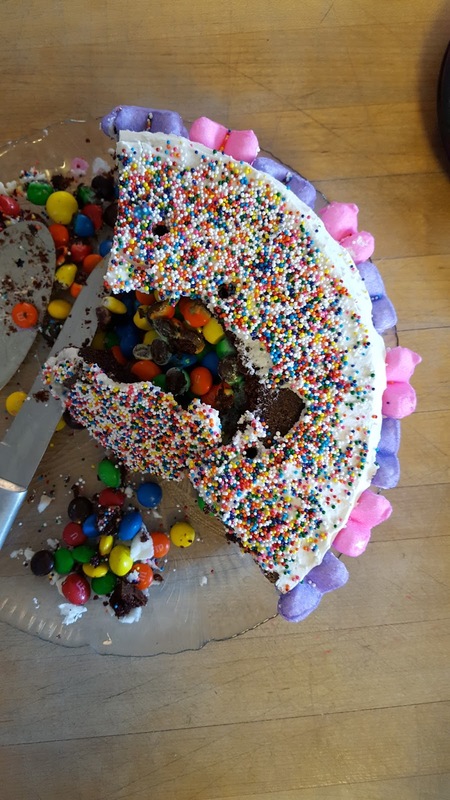 My baby's cake was salvaged. Time to frost. Get out the decorations! 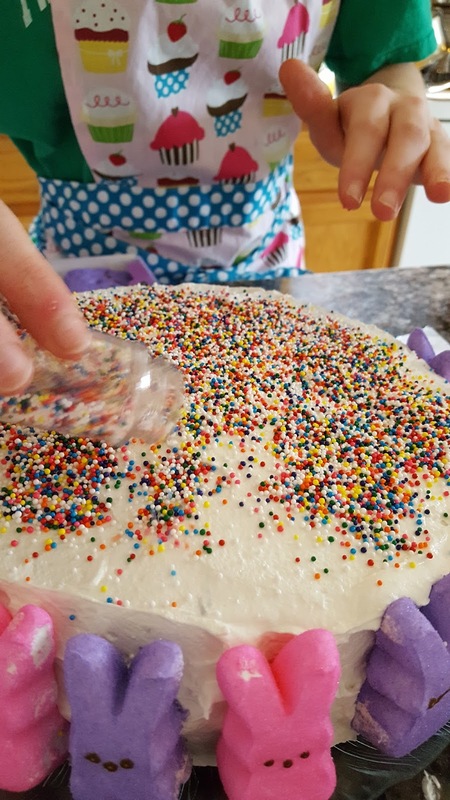 I was so spent, let Ava use an entire package of sprinkles (what the hell!) and 2 packages of bunny peeps. Let's celebrate! Oh! Oops! 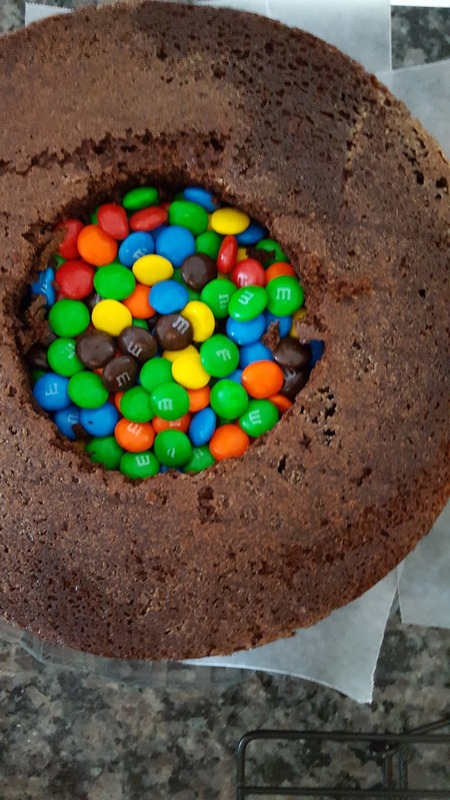 Did I forget to mention that the inside of this delightful creation was filled with M&M's? Because we needed to have even more candy on Easter. 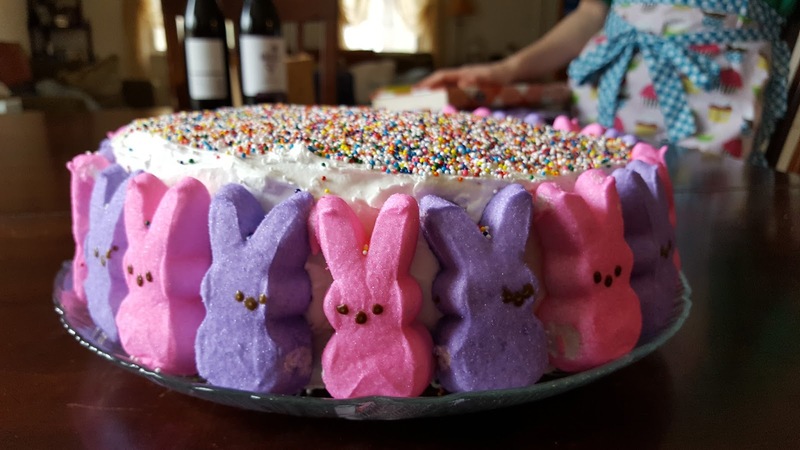 Because a candy filled cake is always better than a regular cake. 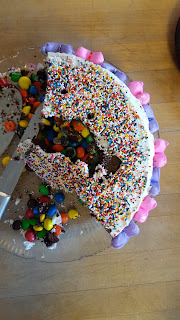 After researching on Pinterest, I found that there are many ways to make a "Pinata Cake". Now it seems that all birthday cakes going forward will need to be candy filled. Well, I guess I can live with that. 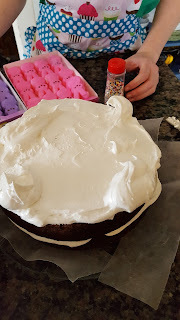 Here are the cake and icing recipes we used, below. You can also take a gander at some fancy "Pinata Cakes" on Pinterest to get some cool ideas, too. Heat oven to 350 degrees. Grease and flour two 9" round cake pans. Combine all dry ingredients. Add eggs, milk, oil and vanilla, beat on medium speed for 2 minutes. Stir in boiling water (batter will be thin). Pour into pans and bake for 30-35 minutes or until wooden pick inserted in center comes out clean. Cool 10 minutes. Remove pans to wire racks. Cool completely. Cut out a 3 1/2 inch wide circle from the center of one layer of the cake. Reserve the removed piece. 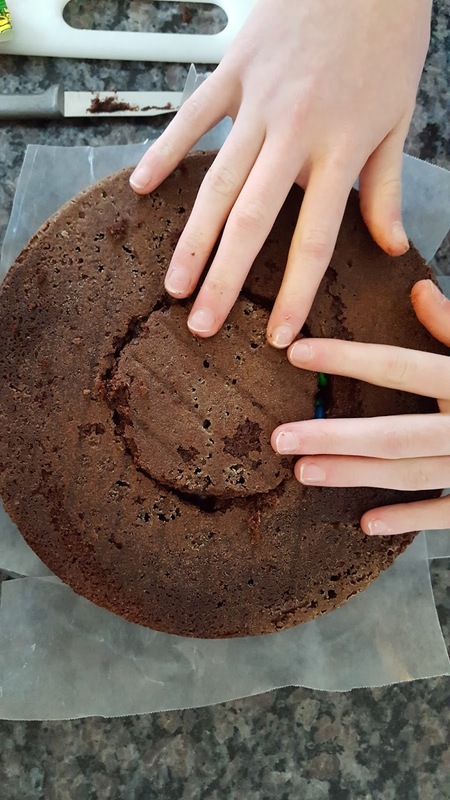 For the bottom layer of the cake, cut a 3 1/2 inch wide circle from the center but only slice halfway through the cake and gently remove the center of the cake leaving the bottom of the layer intact. Place bottom layer on plate. Frost around top edge of bottom layer and place the top layer on frosted bottom layer. Fill center with candy. Trim the reserved center from the top layer to make a cap that will fit the top of the cake and cover the candy inside. Frost and decorate cake. In the top of a double boiler combine all ingredients except vanilla. Beat with an electric mixer on low for 30 seconds. Place over boiling water (upper pan should not touch water). 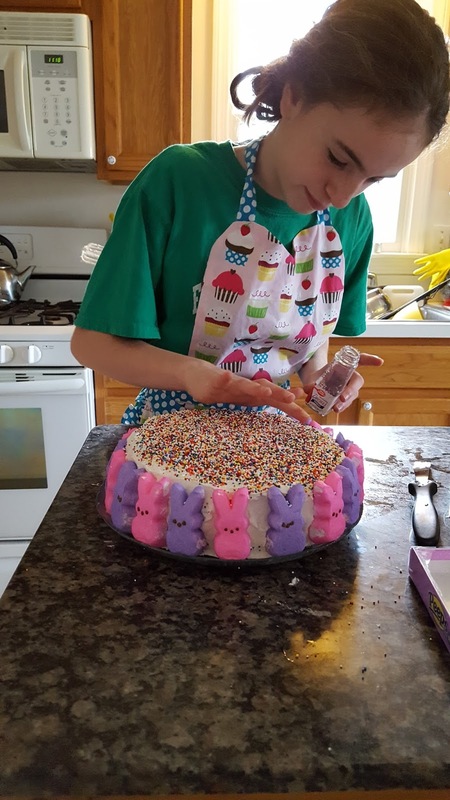 Cook, beating constantly with the electric mixer on high speed about seven minutes or until frosting forms stiff peaks. Remove from the heat an add vanilla. Beat 2-3 minutes more or until frosting reaches spreading consistency. 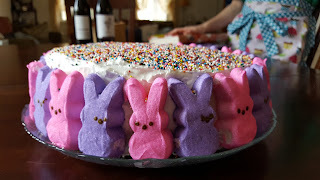 * Work quickly to spread on cake before frosting hardens.